Job finders should have passed Chartered Accountants with good academic records from well recognized Institute / board. Applicants shall get shortlisted on the basis of Test/Group Discussion. ON being shortlisted a merit list will be made of all those contestants who are qualified in Test/Group Discussion and Personal Interview. Shortlisted aspirants for Specialist Officer - Chartered Accountants will receive pay scale of Rs. 40,000 – 70,000/- (Scale I), Rs. 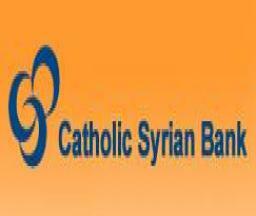 53,000 - 76,000/- (Scale II) which is offered by Catholic Syrian Bank. Firstly, approach on web portal of CSB that is http://www.csb.co.in. This will open a list of the links having latest openings and candidates have to select the most appropriate link which will open the complete advertisement having further details regarding CSB Vacancies. Last Date To Apply Online Is : 07-06-2017.